Born and educated in Brooklyn, New York, identical twin sisters, Sheila and Letty Sustrin, decided at age five that they would become Elementary School Teachers when they grew up. Their dream came true and they taught side by side for 38 years in the Brentwood, N.Y. School District. After retiring in 1998, they realized there was a void in their lives. They missed the interaction, and everyday involvement, with their students. As they always wanted to write books for children, they now began their “Life After Retirement” career as co-authors of a childrenʼs humorous picture storybook series. Their three books all won awards from the Town of Islip. The Sustrins do presentations at schools, retiree and educatorʼs groups, bookstores, and Libraries, on Long Island and throughout the Metropolitan Area. They like to feel that they are helping to bridge the gap between youngsters and retirees. They say that, “Mrs. Belle,” their main character, will NEVER retire. The fourth book in the series, ****The Teacher Who Would Not Retires Becomes A Movie Star**** was released October, 2012. The twins are members of many organizations including, SCBWI, LICWI, AAUW, and Retirees of Brentwood Schools. They are listed in ESBOCES, LISMA, N.Y. State PARP, etcetera. "The Teacher Who Would Not Retire Becomes A Movie Star." The BEA was held at the Jacob Javits Center in New York City from May 30th through June 3rd, 2007. This is the biggest International Trade Show in the book world. 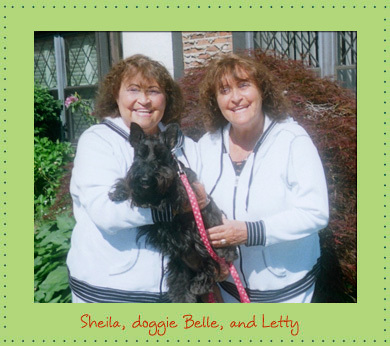 Sheila and Letty Sustrin were highlighted by their Publisher, "Blue Marlin Publications," of Bay Shore, New York, on Saturday, June 2nd. The twins signed their first book, "The Teacher Who Would Not Retire" at the Blue Marlin booth, and then they did a signing at the traditional signing area of their second book, "The Teacher Who Would Not Retire Goes To Camp." Sheila and Letty Sustrin, twin sisters who taught kindergarten and first grade side by side for 38 years, said retirement was not only terrifying, it was unimaginable. "We'd been fighting it for many years," Letty said. But a financially appealing retirement package convinced them to leave their classrooms in 1998, and they said they had to find a way to pass the time. "We'd always wanted to write," Letty said. So they did, spinning out in 2002 "The Teacher Who Would Not Retire," a children's tale not so far from their experiences. Surprised by the book's success, they wrote "The Teacher Who Would Not Retire Goes to Camp," which was released three years later. "We go to children's groups and private and parochial schools," Sheila said. They read to young children, and teach about retirement. Their second careers are as fulfilling as their first, the sisters said. The "Friends of the West Hempstead Public Library," in conjunction with the launching of the newly constructed West Hempstead Public Library, will be recognizing distinctive authors at a Cocktail Reception that will be held at the library on Thursday, October 18, 2007. This evening will bring guests from the town government, friends and family of the community, and guest speakers. This will be a prestigious recognition event for exemplary authors who have distinguished themselves in communities, business or academics. Each author has made significant accomplishments and continues to inspire and impact potential authors for success in future generations. Sheila and Letty Sustrin will be two of the authors that will be highlighted.